Why do you need an aquarium filter? What are the basic types of aquarium filters? An aquarium filter helps to maintain a healthy environment for all of your aquatic inhabitants. A good aquarium water filter will keep the water clear for viewing, while providing water that is free from particulates and toxins that are dangerous to aquatic livestock. There are three basic types of aquarium filters: biological, mechanical and chemical. The type of fish tank water filter needed will depend on the size of the aquarium or fish tank, the quantity of the inhabitants and the amount of maintenance the system will require. Frequent filter cleaning and water changes are also necessary. Aquarium filters may utilize a combination of any of the following types of filtration. 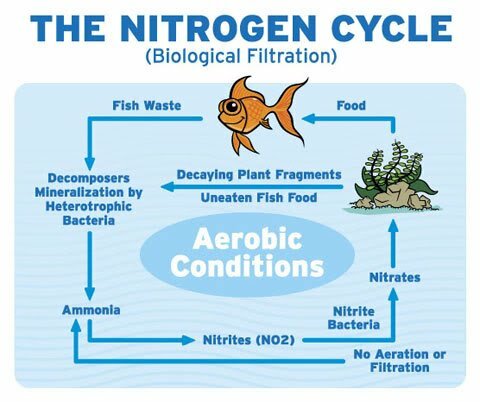 In biological filtration, different types of beneficial bacteria convert nitrites and ammonia, the toxic byproducts of aquarium waste, into less toxic nitrates. This process is known as the Nitrogen Cycle, and in order for it to occur, there must be an oxygen-rich area for these bacteria to grow (See Fig. 1). When cleaning the aquarium filter media, it must be rinsed in aquarium water, rather than tap water, so that the beneficial bacteria needed for biological filtration is maintained. Mechanical filtration removes waste and other suspended particulates from the water. The aquarium filter media, which may be in the form of foam, filter floss, pads, micron pleated paper or diatomaceous earth, is designed to catch and hold various particles as the water flows through it. Chemical filtration removes dissolved waste from the aqarium. Chemical filter media can also remove toxins such as phosphates, ammonia, nitrates and other toxins. Coupled with biological filtration, chemical filtration can be a very effective method and can cut down on the frequency of filter maintenance and water changes. The most common media for chemical filtration is activated carbon. Sponge filters provide an effective method of biological filtration. An air pump draws water through a sponge-like material allowing for the growth of beneficial bacteria onto the sponge (See Fig. 2). It is this bacteria that provides the biological filtration. Mechanical filtration occurs as the sponge also traps particulates in the water. Chemical filtration is nonexistent in this method, and frequent water changes are necessary if this is the only form of filtration used. These filters have limited use and are only effective in small aquariums with a small number of aquatic inhabitants. The corner/box filter is a box that sits inside the aquarium in one of the corners. It comes in various sizes for small to medium tanks and is capable of providing all three types of filtration. Layers of floss are typically used as the media for mechanical filtration, along with activated carbon for chemical filtration. The bacteria growing on the filter media provide biological filtration. An air pump draws the water through holes in the bottom, through the filter media, and releases it out through holes or slits in the top (See Fig. 3). The efficiency of all types of filtration are limited due to the low levels of water flow and oxygen content. Frequent filter changes are necessary, but difficult since the entire canister must be removed, disrupting the flow of the aquarium. It is better to replace only half of the mechanical filter media at a time, in order to retain the beneficial bacteria necessary for biological filtration. Because of their low price and easy maintenance, power filters are some of the most popular on the market, and are great for beginner aquarium hobbyists. As the name implies, the hang-on-back/hang-on-tank (HOB/HOT) power filters are designed to hang on the back of the tank and are capable of all three types of filtration in one self-contained unit. The water is drawn through a u-tube into the filter media, which in most cases is contained inside of a cartridge (See Fig. 4). Power filters are generally not well-suited for freshwater planted or saltwater aquariums. Internal power filters function in a similar manner, but instead of hanging on the back of the tank, these may be completely submerged in water. Canister filters are external units placed beneath the aquarium (See Fig. 5). These also perform all three types of filtration, but are more expensive than power filters because they are more efficient and very easy to maintain. Because these filters are pressurized, they are highly effective for mechanical and chemical filtration; however, biological filtration is limited. Often, canister filters contain multiple trays, with each tray providing a different type of filtration. An undergravel filter is a slotted plate that is installed underneath the gravel inside an aquarium, with multiple tubes extending upward toward the water's surface. A power head is usually placed on top of the tubes to draw water through the gravel and up through the tubes (See Fig. 6). Biological and mechanical filtration occur as the water passes through the gravel, and activated carbon cartridges may also provide chemical filtration. Although these filters are priced low, they must be maintained on a weekly basis, due to the possible formation of dangerous hydrogen sulfide gas within the gravel bed. In order to prevent this buildup, the gravel must be vacuumed regularly and accompanied by frequent water changes. There are many factors to consider when buying an aquarium filter. When making a selection, keep in mind that you must accomplish at least mechanical and biological filtration. Certain filters are better at biological filtration than others. You may want to consider supplementing a power filter or box filter unit with a sponge. This will provide a larger surface area on which beneficial bacteria can grow, further supporting the existing biological filtration. Other factors to consider are the size of your aquarium and flow rate. Corner/box filters work best in smaller tanks, while power or undergravel filters are typically used in mid-size tanks. The rate at which water flows through the filter also impacts the success of any system. All water in the tank should be run through the filter at least four times each hour. Whatever your choice, ease of maintenance is also important to consider. Some filters require more frequent water changes. Undergravel filters require weekly gravel cleanings as well. Typically, higher-priced filters are more efficient and easier to maintain.